There are 29 days remaining in the FY 2018 Form 471 filing window and most of you are at the stage where you have conducted your bid evaluations and obtained board approval. Congratulations! It’s now time to sign your Category 2 contracts, upload them into EPC, and file the Form 471. Below are more than a dozen helpful hints to make your Category 2 Form 471 filings and subsequent PIA reviews as painless as possible (and the FY 2018 C2 Filing Guide is attached). Please be sure to read this message before filing your C2 applications. The FCC has just announced the inflation factor for the FY 2018 E-rate funding cap and, although they haven’t been officially announced yet by USAC, we expect the C2 budget amounts for FY 2018 to be as follows: $156.23/student, $5.21/sq. foot(Libraries with IMLS Locale Codes 11, 12, or 21), or $2.39/square foot (all other libraries). Don’t Exceed Your Category 2 Budgets! Whatever you do, don’t request more Category 2 funding for a school than what remains in their budget. Why? Your application will likely be moved to the end of the PIA review list, and PIA will just make you reduce your funding request anyway. And while this sounds easy to do, it’s not because you will have to explain exactly which component from which FRN Line Item must be removed in order to come in under budget. If a school’s C2 equipment costs exceed the school’s available C2 budget, you have two choices: 1) list the amount that is “over budget” as ineligible on the FRN and then explain this in the narrative, or 2) remove components or reduce the cost of the components from the FRN entirely to come in under budget. To determine the amount remaining in each school’s C2 budget, cautiously use this tool: https://sltools.universalservice.org/portal-external/budgetLookup/. I say “cautiously” because only the “Approved Pre-Discount” (green arrow) amount is 100% accurate. This figure includes the pre-discount committed amount for FY 2015, 2016 and 2017, minus any approved Form 500’s that returned commitments or cancelled funding. 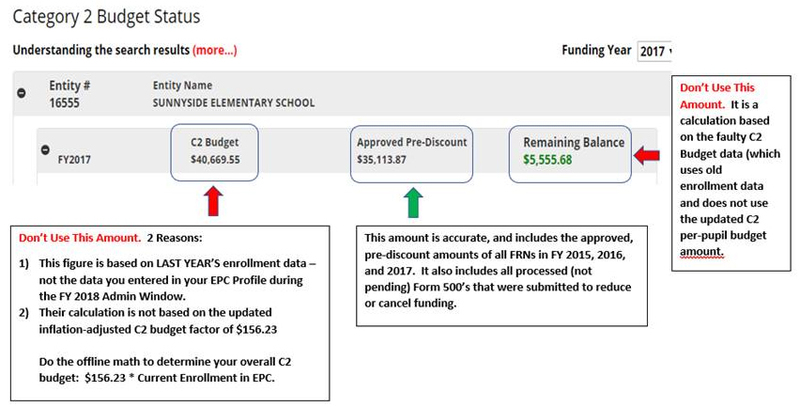 Unfortunately, the “C2 Budget” figure (red arrow) is faulty for 2 reasons: it is based on your FY 2017 enrollment, not the enrollment you entered into the EPC profiles during the FY 2018 Admin Window, and USAC has not yet adjusted the budget for the FY 2018 inflation factor. So do the offline math as follows: (FY 2018 School Enrollment in EPC * $156.23) – “Approved Pre-Discount” Amount (green arrow). Remember: C2 budgets are calculated by building, not by district. All Category 2 purchases require a signed contract prior to submitting the Form 471. This can be as simple as signing/dating the vendor contract, and including the contract term and any funding contingencies. Before starting your Form 471, upload the signed contract into EPC. Landing Page > Name of District > Contracts > Manage Contracts. The Contract Module Guide can be found at: http://e-ratepa.org/?p=24081. The PEPPM Contract Module Guide can be found at: http://e-ratepa.org/?p=24161. Firewalls: Only the actual appliance and basic software are eligible. Anti-virus, anti-spam, filtering, and DDOS features/software are not eligible and must be removed or cost-allocated. If it’s a bundled package, your vendor can provide you with the accurate eligibility percentage. UPSs: Network Cards are not eligible and must be removed from your funding request. Also, don’t forget that only eligible equipment may be connected to the UPSs. When creating Internal Connections FRNs with multiple FRN Line Items or multiple Recipients of Service, applicants can use a Bulk Upload feature where a Template is created off-line and then uploaded into the FRN. It’s a true lifesaver for some applications! For more details about the Bulk Upload feature and to view the Guide, see: http://e-ratepa.org/?p=24491. Product licenses are E-rate eligible and should be requested as Internal Connections on the 471. The full cost of a multi-year license may be requested upfront in the year it will be purchased, even if the number of license years exceeds the number of years remaining on a school’s C2 budget. Request the license as if it is the piece of equipment belonging to the license, and then list the license SKU in the ‘Model’ field. That way the PIA reviewer will know it is for a license and not the actual product. Be careful not to mistaken maintenance services as product licenses. Also, E-rate rules do not permit the requesting of multi-year maintenance services in a single year – these must be amortized and requested in the funding year for which the service covers. If your Category 2 request contains multiple components, you must create a separate FRN Line Item for each component (model), and then show the # of units, the cost per unit, and which schools will be using the equipment. For example, a common mistake applicants make is to request just a single FRN Line Item for switches, with a single SKU. Then during USAC invoicing, the invoices are denied because the individual components were not listed/approved on the Form 471. Create an Internal Connections FRN and the FRN line items for the equipment being installed. Then create another FRN Line Item and for “Type of Internal Connection,” select > Miscellaneous > Installation from the drop down options. Then select the Product Type (switches, wireless APs, etc), then the Make and Model of the equipment being installed. For structured cabling, try to have your vendor contracts be for a single price, by building – not broken down by widget. Then just create 1 FRN Line Item in the Form 471. Vendor invoices, therefore, also should have just a single price, by building – not broken down by widget being installed. On the Form 471, create an Internal Connections FRN. Then create a single FRN Line Item and for “Type of Internal Connection,” select > Miscellaneous > Installation from the drop down options. Then select the ‘Cabling’ for the Product Type > ‘Other’ for the Make > Type in name of the vendor contracted to do the installation > type “structured cabling installation” for the Model. If a piece of Category 2 equipment is shared by two or more schools, the cost of the equipment must be allocated from the C2 budgets of the schools sharing the equipment (core switches and wireless controllers are good examples of shared equipment). Deciding which cost allocation method to choose — and making sure you do so correctly on your Form 471 — is important. You can either 1) allocate the costs equally (the same amounts) from each school’s C2 budget that is using the equipment, or 2) allocate the costs on a weighted basis. The second option requires some off-line math to be done, but it allocates more funding from the schools that have larger C2 budgets which may be advantageous to you. Here is a Guide to help you figure out the cost allocation guidelines/math for shared equipment – http://e-ratepa.org/?p=12651. I’ve recently worked with several applicants having trouble submitting their FY 2018 Form 471s and the commonality seems to be whether they used the Copy FRN Feature. Therefore, starting now, I recommend that applicants NOT use this feature when creating their Form 471 FRNs for FY 2018. Note: If you’ve already created an FRN using the Copy FRN feature, and if you encounter a problem, delete the FRN and start over.